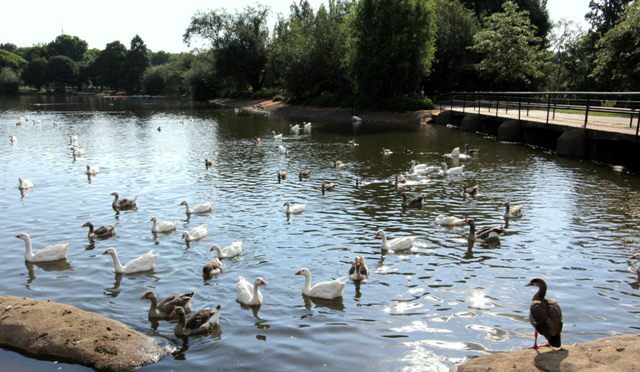 Zoo Lake is one of Joburg’s most popular city parks. It has what you’d expect from a city park with a lake in it: ducks, row boats, picnickers, barking dogs, trees, park benches. But like many places around here, it has just enough South African quirkiness to be worthy of a blog post. 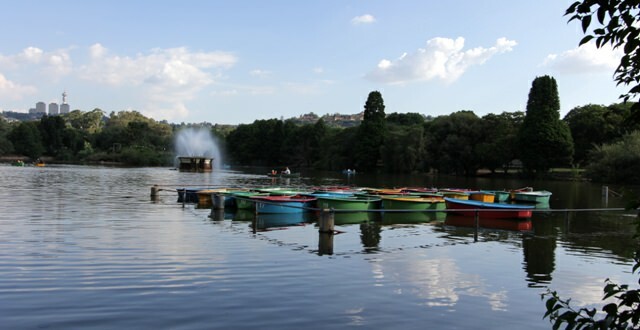 Zoo Lake (so named because it’s across the road from the Joburg Zoo) is less than 10 minutes’ drive from home but for some reason I hadn’t been there until a few days ago. 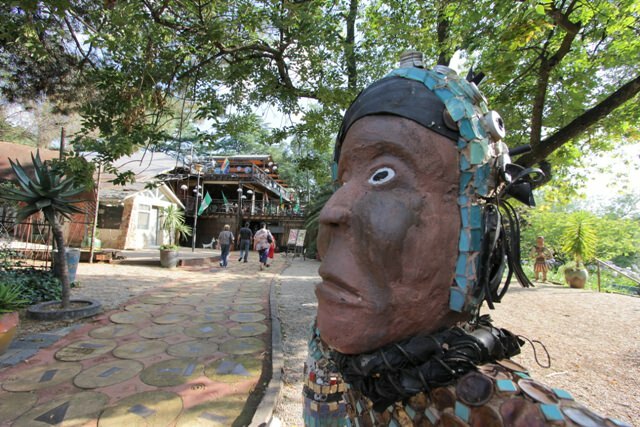 Highlights of the park include Moyo, an African-themed restaurant next to the lake, and an island in the middle of the lake that serves as a roost for thousands of indigenous birds. The entrance to Moyo at Zoo Lake. We didn’t eat there, although I’ve eaten at another Moyo in Joburg (there are several throughout South Africa) and found it good but a little touristy. 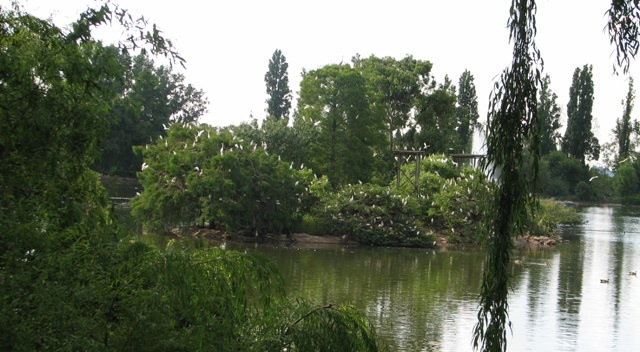 The Zoo Lake bird island and its resident colony of egrets. I showed up in my running shoes; Joe walked while I ran. The lake is only a half-mile around so I got bored after about 15 minutes, but it was relaxing and mercifully flat (unlike hilly Melville). I ran a couple of laps, then strolled one time around with Joe to take pictures. Colorful rowboats. You can see downtown Joburg in the distance, off to the left. There are lots of geese at Zoo Lake. They’re cute, but I had a hard time dodging the goose poop while jogging. Moyo has a beautiful rooftop deck, which I’m sure would have been a lovely place for a (pricey) post-run/walk sundowner. 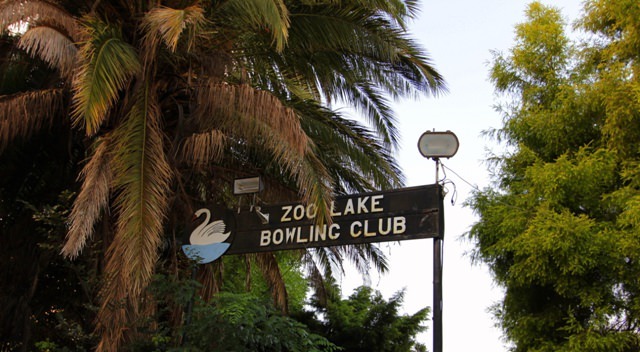 But instead Joe took me to a true hidden gem — the Zoo Lake Bowling Club. No, Americans, it’s not a bowling alley. It’s a club for lawn bowling, which is like bocci on grass. Lawn bowling is a serious sport here, and Zoo Lake actually hosted the Lawn Bowls World Cup in 1976. There were no matches going on (to my very great dismay) because we went during the holidays. But it was still a great place to sit and have a beer. For some reason I expected the atmosphere to be kind of stodgy and colonial, but it’s just the opposite. The crowd was young and diverse and the beer was cheaper than water. Beers al fresco at the Bowling Club. According to Joe, the Bowling Club is also a perfect place to sit at sunset and watch wild ibis soar in to roost at the Zoo Lake bird island. He says they fly in by the dozen in beautiful V formations. Unfortunately I missed out on that too — I guess the ibis also take the holidays off. 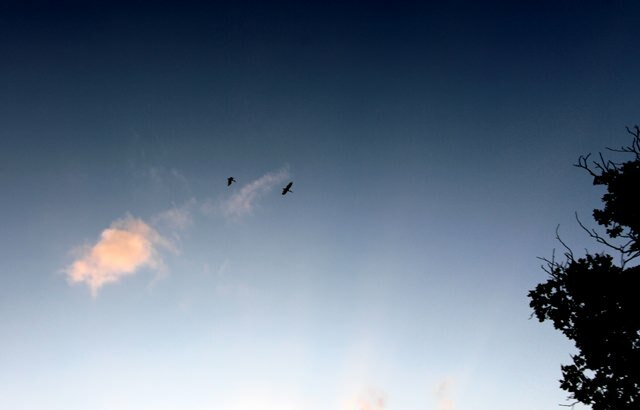 But I did glimpse a solitary pair of them overhead as we walked to the car. Nice end to a locals-only afternoon in Joburg. I went once, in the late Eighties, I think. Sounds like it’s changed a lot since then. Yeah, I saw a sign saying that the bird island was rehabilitated in 2006. Not sure what it was going on in the lake before that. Once again, thank you for sharing your neighborhood. I like the images. Your photos and descriptions show a part of the city I was not aware of. Do you drink local SA beer? If so, what beers stand out to you? Have you been to the Joburg Zoo? To be honest, SA beer isn’t very exciting. The most popular beer is Castle, which is similar to Bud. (Incidentally, Castle is owned by SAB Miller. I had no idea that a South African company owned Miller until I got here.) I don’t think there are any good South African dark beers or microbrews. When Joe and I drink beer we usually drink Windhoek Lager, which is a Namibian beer. South Africa is really a wine-lover’s country. South African wine is delicious and cheap. I need to write a post about wine! Oh, and no, I haven’t been to the zoo yet. Which is weird because I love zoos. We need to go. I love your posts about Joburg. I was born there, and lived there until I was about 6 years old. I’ve got these vague memories of things like Zoo Lake, but not the mental images to go with them. I’m so glad you’re enjoying them Lisa! 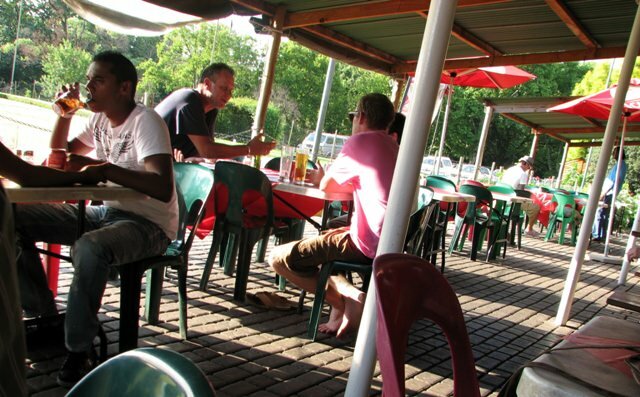 I love writing about Joburg too, and I’ve barely scratched the surface of this town. I’m just loving your blogs. We left S.A. 4 years ago and now live in Calgary, Canada and I’m really enjoying seeing South Africa (and Swaziland where I was born) through your eyes! One of my favourite places to go (during the week when less people are around) was The Walter Sizulu Botanical Gardens in Roodepoort, west of Joburg. They have a fascinating Black Eagle breeding program. The restaurant, Eagle’s Fare, was pretty good the last time I went! I miss the Cape winelands. Somehow drinking a Boschendal Chardonnay in Calgary, just isn’t the same as drinking it on the estate or watching the sunset on the beach in Cape Town!!! Hi, I’m so glad you’re enjoying the blog! I love the Walter Sisulu Gardens too. I wrote a blog about them a few months ago if you’d like to check it out: http://2summers.net/2010/10/18/tortoises-birds-locusts-and-one-fantastic-sunset/. I haven’t been to the Cape yet but I’m going for a weekend in late January — very excited. It is a very nice place for a family picnic. Thanks for reading!